Through INCubatoredu and similar educational programs, students are solving real-world problems with their own products and services. As a grunge-rock instrumental walk-up song blares through the speakers, a team of high school students in business professional dress ascend the stairs of the stage at Varidesk headquarters in Coppell. The Coppell High School students present a new business: a teen-only nightclub called The Muse. It would be a drug- and alcohol-free space where teenagers can eat, socialize, dance, and listen to music. Outlining consumer and market research, financial planning, and other evidence, students proved up their concept to an audience of parents, mentors, school district administrators, Coppell Chamber of Commerce members, and four judges. With 20 high schools using INCubatoredu in the state, Texas has the second highest participation in the program following Illinois. 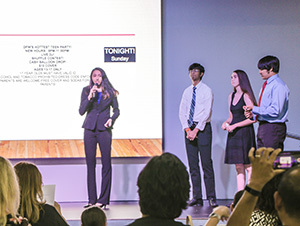 Team Muse was one of three groups from the high school’s year-long entrepreneurship class, INCubatoredu, that made it to Final Pitch Night, a Shark Tank-like event, held May 23 at Varidesk. INCubatoredu is an entrepreneurship curriculum first created for high school students by Barrington, Illinois-nonprofit Uncharted Learning. With 20 high schools using it in the state, Texas has the second highest participation in the program following Illinois. As a result of taking the course, 23 businesses have been launched by student teams since the inception of INCubatoredu in the 2013-2014 school year. While piloting the first year of INCubatoredu at the high-school level, instructors encouraged Uncharted Learning to create material for younger students. “Our educators and administrators have particularly shared with us that for girls, the sooner you start the better the chances are that when they get to high school, they will not have categorized business or entrepreneurship as something that is for boys only and not for girls,” said Margarita Geleske, chief evangelist at Uncharted Learning. In a new wave of integrating more experiential learning in schools, INCubatoredu is one of several curriculums used throughout North Texas and the U.S. that teaches students the entrepreneurial mindset through creating their own businesses. The INCubatoredu course, offered for upper-level high school students in the Coppell school district, is part of the business management and administration and marketing pathways. Professionals in the local business community serve as mentors and judges as well as guest lecturers in the class. Team Muse competed against Medi Speed, a full-functioning app created to help sick patients get access to a local urgent care in a timely manner by displaying wait times and an in-app GPS, and Simple Smart, a roving electronic trash bin for homeowners that cuts down the time its takes for a city’s waste management department to pick up trash. 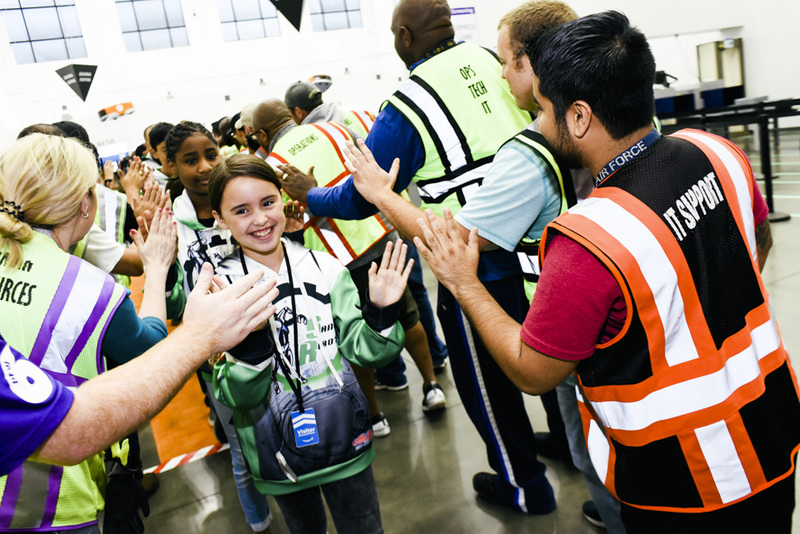 Judges — or “sharks” — included Coppell Mayor Karen Hunt; Cliff Long, owner of Sovereign Mortgage Services, Inc, and Coppell City Council member; former Dallas Cowboy and owner of Steadfast Fitness & Performance Isaiah Stanback, and Varidesk CEO Jason McCann. Varidesk, which has been named the fastest-growing entrepreneurial company in Dallas by Southern Methodist University’s Caruth Institute for Entrepreneurship in the Cox School of Business, occupies a 45,000 square-foot once warehouse building turned state-of-the-art company headquarters in southern Coppell. According to the company, Varidesk currently outfits 96 percent of Fortune 500 companies with its adjustable standing desk and has begun expanding from corner offices into classrooms with its purchase of Stand2Learn, a producer of standing desks for students, in February. McCann, who has been on the district’s INCubatoredu board since its inaugural 2016-2017 school year, said the real-word curriculum the students are being exposed to is similar to what he learned at the University of Houston while getting his MBA. At Final Pitch Night, the board of judges assessed the teams based on how viable their business idea was over the quality of their presentation skills. At stake: $1,000 worth of Varidesk product per each member of the winning team. Stanback retired from the NFL and started his fitness facility, Steadfast Fitness & Performance, in Coppell in March 2013. After deliberation, the board awarded Simple Smart first place. The idea for the roving trash bin came from one team member’s personal experience seeing trash bins crowding and falling over in alleyways behind homes. The students credited their mentor, Leonel De La Fuente, for helping them create Simple Smart. Members of the local business community can get involved in the INCubatoredu program by being on the board of advisors, a team mentor, or a coach. Coppell had five advisors, 11 mentors, and 16 coaches this year. Tammy Taylor, director of community engagement for Coppell ISD, said the district drives awareness of the program through the local chamber of commerce, parent networks on campus, and word-of-mouth referrals. De La Fuente, who is co-founder and partner of Wildcatter Beverages, guided them through the process of developing Simple Smart. De La Fuente and his business partner started out selling coffee in a food truck at Klyde Warren Park. Last October, they sold the truck to open up a facility to manufacture their cold brew coffees and teas, which will begin production in a month. Coppell ISD is not the only school district in the Dallas-Fort Worth area using INCubatoredu. Irving ISD implemented the program this school year at MacArthur High School, which has a school of business and entrepreneurship. It also uses Uncharted Learning’s elementary and middle school entrepreneurship curriculums in all of its elementary schools and eight of its middle schools. 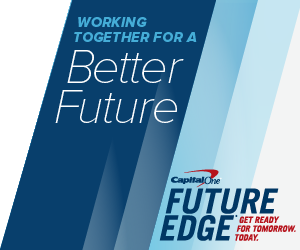 The school district has partnered with professionals at companies such as AT&T, British Telecom Americas, Farmer’s Insurance, Fuse Solutions, and Primerica for the program. Irving previously used Network For Teaching Entrepreneurship, or NFTE, curriculum at MacArthur and still utilizes the program at its other high school campuses. Frisco ISD will pilot the INCubatoredu program at four of its high schools during the 2018-2019 school year to enhance its existing entrepreneurship course. The school district is currently seeking local professionals to volunteer for the program and is holding community information nights and speaking to rotary clubs and networking organizations to get the word out. Other entrepreneurship education programs used in the DFW area include Junior Achievement of the Chisholm Trail’s JA Company Program and Young Entrepreneurs Academy, among others. Developers, designers, and cities are pushing sustainability forward in North Texas, creating friendly and beautiful structures.